Grommets for your banner aka banner eyelets. Confused? What are those vinyl banner eyelets called aka grommets? Grommets are the industry name for the vinyl banner eyelets on the edges of banners. Most banners have grommets. The standard banner eyelet (grommet) has a 5/8″ diameter hole, so you can hang your banner with rope or zip ties. Underneath the grommets, banners are usually reinforced (see other banner finishes.) They are usually hemmed, either with a sewing machine or special heat-welding machine that seals the plastic over itself in a double-thick layer. This helps keep the grommets from tearing out of the banner. When you’re hanging a banner, try to use as many grommets as possible. Zip ties tend to be the most effective way to hang banners from their grommets. Over-the-street banners have more grommets than most other vinyl banners, usually every foot or every 24”. They are made to withstand high winds, so they need more eyelets unless specified for other. You should use at least every other grommet in this type of banner to make sure it doesn’t rip or fall. Pole pocket banners usually don’t have any grommets. Instead, the top and bottom edge of the banner are folded over and sewn or heat-welded to make a pocket in the banner. Then, you insert a pole through the opening and carry it in a parade or hang it in a store. Mesh banners are lightweight outdoor banners, printed on special vinyl that has holes throughout the banner. They look similar to a sports jersey. The vinyl mesh is very fine, so you still see the design on your banner. Vinyl banners are opaque. What are mesh banners good for? Mesh banners are great outdoors because the wind flows right through them. For the most part, mesh banners last longer than regular vinyl banners outside because they reduce wind resistance. That means less wear and tear on your banner’s hem and grommets. Besides making your banner last longer, mesh banners make it easier to read your message because there are no big wind slits or wrinkles. Mesh banners lie flat much more easily because the wind goes right through them. Whether you are placing a large banner over the street for a few weeks, or hanging a small banner in a windy area, mesh banners ensure that people will be able to read your message, and your banner will hang outdoors for a long time. 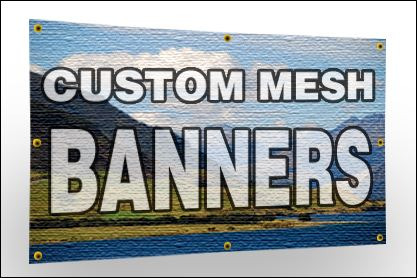 Mesh banners are recommended in windy areas. Banners and signs are an inexpensive method of advertising that is also very effective. But for these banners and signs to be effective they must be displayed properly and also they require some care especially if you want them to last for several years or more. You will need to give some consideration to where you are going to place your banner, the size requirements, the materials that the banners or signs should be made of and how you are going to display them. 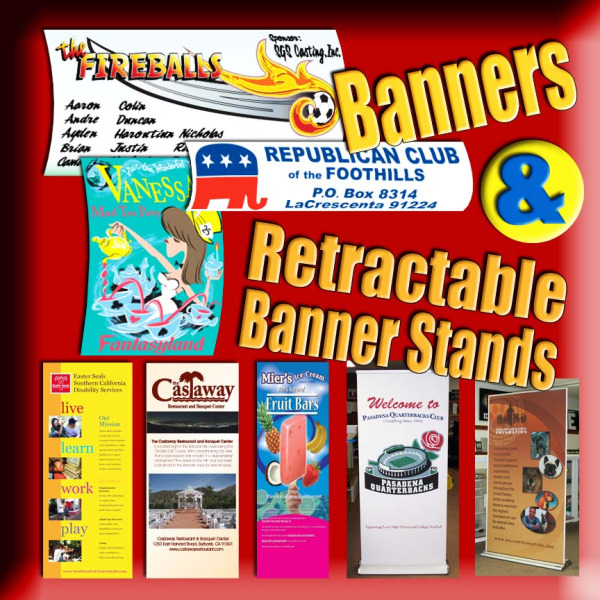 Since there are many methods of display such as banner stands or banner frames or pole pockets for banners and where the signs will be attached or be standing alone. It is important that you make sure the public will actually see and read the banner. You need the banners to be visually arranged so that they work within their surroundings. You want them to hang so they can be seen and understood yet you also want them to be visually stimulating and sell your products or services. You can hang them directly over the merchandise which directs the customers to that location. You can display signs so they form a route that you want the customer to take from the back to the front of the store. Use them creatively too. Signs and banners need to be clean and look good. If they begin to look shabby you need to make sure the banners and signs look clean for a visual display. Stop! No Dumping Here! Signs let you say exactly what you mean. Post signs to let visitors and residents know that there is absolutely NO dumping here. Dumping should occur only in designated dumpsters. 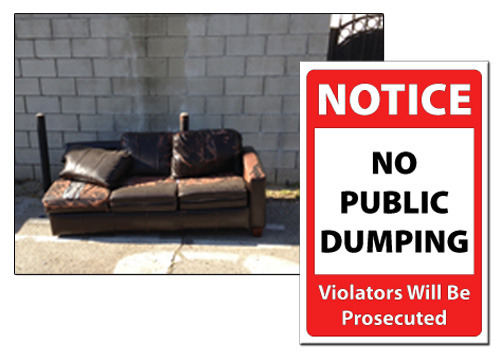 Prevent your area from becoming litter, furniture and garbage strewn by clearly marking No Dumping areas. • Signs and labels come in a variety of sizes and materials to let you choose what fits best with your property. • The Sign Studio will design and customize your sign with your local Regulation and Fine information along with "This Site is Under Surveillance". 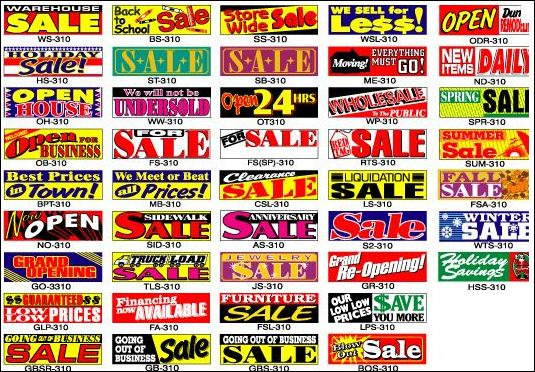 • Signs and labels are easy to hang, but still guaranteed to last for years even outside. Don't let your dumpster go to the dump! Signs help you regulate the rules of the dumpster. Post Dumpster Rules signs or individual rules on your dumpster to make sure it stays clean. Prevent Dumpster Hazards. Dumpster Diving can harm health and is illegal. A Dumpster may have ignitable or corrosive waste. Popularity of vinyl banners is growing every day due to the durability and affordability. With the rapid advancement of technology, everything ranging from the colored text to real life images can be printed on these banners. Although the maintenance of these banners are pretty simple, there are some factors that must be taken into consideration to make banner care much easier and efficient. It is a known fact that vinyl banners are very durable. The high quality vinyl banners used for outdoor campaigns can last as long as one to five years. The material (vinyl) used in these banners can be washed. For effective cleaning, some mild soap or detergent can be used. There is a misconception among people that the detergent will fade print. High quality print on vinyl banner used is resistant to the effects of mild detergents (Note: Harsh cleaners can damage the vinyl banner). If you fold the vinyl banner it will have permanent creases. It is always good to roll your banner instead of folding it. While folding the vinyl banner rotation, you must ensure that the prints are facing the outside. When re-using the banner, you can find some creases in them because of storage conditions. Removing wrinkles from vinyl banners is very simple. The necessary equipment for removing wrinkles is a clothing iron and a damp cotton cloth. Just place the banner in a flat surface and place wet cotton cloth over it. Once this is done, the iron damp cotton cloth placed over the banner. The steam produced during this process to eliminate the folds in the banner. Proper care should be taken to iron the fabric that has no direct contact with the banners which will result in permanent damage of the same. All three of these tips will make vinyl banner care much easier than ever. Short of a security guard or a watch dog, nothing protects your property better than Private Property and No Trespassing Signs. The best part is, these signs are extremely cost effective and statistics show that people and places with signs posted are less likely to be bothered by unwanted situations vs. properties that do not have any private property signs. A Private Property or No Trespassing sign lets potential violators know that you take your property's security seriously. A threatening sign also sends a bold message to trespassers and is sure to deter almost anyone who crosses over your property lines uninvited. • Private Property signs show people that you mean business. If you're serious enough to post a sign, you're serious enough to take action against trespassers. • Our signs are made from the toughest aluminum around. Waterproof, weatherproof and rustproof, these Private Property signs are guaranteed to last for many years outdoors. • Our signs are effective, we have many to choose from or we will custom design yours to fit your needs. Sign Advertising & Marketing Ideas for you! It is important to choose business outdoor signs that will work for your business. 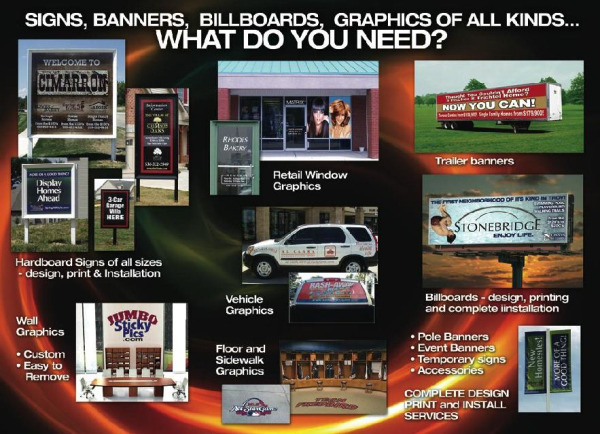 There are a variety of outdoor signs you can use to promote your business. Depending on your budget, some options are more feasible than others. The type of business you're in will also impact your choice. You'll need to familiarize yourself with the different problems that may arise when it comes to advertising your specific business. 1. Use yard signs to advertise your service business. This type of outdoor signage is placed in the yards of customers around town. 2. Consider using outdoor signs to help potential customers notice your building. By putting up a lighted sign, people will notice you at night and in bad weather. If you don’t want an illuminated sign, try adding separate lighting to shine on the sign directly. 3. Reach specific target markets by using large commercial outdoor signs. Billboards and similar types of signs yield high visibility. Our Team at The Sign Studio is always ready to help! Of course, the chains, corporations and franchises that utilize these powerful forms of signage, tied into National Advertising Campaigns, have a tremendous advantage. How can "Mom and Pop" aka Small Businesses; compete with such an advantage? What will grant the small business owner entry to the American marketplace? The answer is simple: The on-premise sign. It is the least expensive, most effective form of advertising available to the small business. Even in its most basic form, it has been shown to be responsible for bringing in as many as half of all new customers, though 25-35% is more likely to be the case. When it is designed as part of an overall site package and tied in with other forms of advertising, its benefits to the bottom line can be even more substantial. Signs open the doors of a community to all and allow all to participate in the economic activity going on there. Over half of all first time customers will stop because they saw the on-premise sign. The sign allows anyone who wants to open a business, no matter who they are, to effectively compete with a wealthy or well-connected business owner. Furthermore, the sign tells everyone who sees it that they are welcome to come inside and conduct a business transaction. In the workplace it is necessary to clearly display your policies on smoking, but it can be equally important to maintain a certain degree of politeness and respect towards patrons and visitors. Thank You for Not Smoking signs get your message across while remaining courteous and respectful. Our wide variety of designs and sizes also ensure you'll find a sign to fit your needs. • Firmly maintain your policies with discrete but effective messages. • Call or e-mail us for our selection of Thank You For Not Smoking Signs and Labels, and choose the one that works best in your facility. • Professionally designed signs and labels look great in any environment, and get the job done! Did you know........Every property needs a wide variety of signs. Indoor spaces require lighted exit signs, plastic or metal room plaques and customized directional signage. Outside, prominent site signs are not only sensible for marketing reasons but are also required by law for safety and directional reasons. Additionally, the buildings and gates of every property are ready made billboards. The owner or staff simply needs to take advantage of them. The very clientele that the owner wants to attract drives by on a daily basis. Inform them. The use of property signs and tasteful advertising banners to highlight features, amenities and current specials can be particularly effective. The Sign Studio can meet these and all your company’s other sign needs. Our experienced staff can help with all aspects of property management sign creation. From the initial graphic design to the manufacture of the finished piece, we will provide guidance and advice to produce the most impactful, cost effective sign possible. Take care of business before your neighbor’s dog does. Keep your garden clean by keeping all pets out. Display one of these Garden Pet Signs to make sure your property is kept clear. Utilizing these signs will take away the annoyance of getting dog poop on the bottom of your shoe and keep your garden looking pristine. • Take a look at our Garden Pet Signs, Garden Signs, Keep off Grass Signs. Make sure the grass isn't greener in your neighbor's yard! Post Keep Off Grass Signs to remind everyone that your grass is part of your private property. Perfect for homes, apartment complexes or parks, protect the grass wherever you need. A Keep Off Grass Sign will remind people when sitting, playing and throwing a frisbee to their dogs is prohibited. Keep your lawn looking its finest with any of our signs below. Our signs are effective and studies show that you are more likely to have uninvited situations by using effective signs. First impressions count and whether working on behalf of a client or developing your own branding campaign, The Sign Studio can provide high quality sign and graphic solutions for your next branding project, promotional campaign or event preparation. Whether you are an architect or surveyor working on a renovation or new build project, we can work with you to assist in the specification of signs which will compliment your building and its surroundings. If you are a marketing agency looking for ideas for a rebranding project or promotional campaign, please contact us and we can discuss through all of the options available to you. With all the publicity surrounding hospital infections this Hospital decided to tackle the issue head on. The Sign Studio has been part of extensive regeneration projects providing a range of signs and graphic solutions for many buildings. Working with Media – The Sign Studio has completed a range of signage including advertising boards and floor graphics to help promote their services. Back-Lit Channel Letters | The Museum of Martial Arts – Let it shine….. LED lighting is getting brighter each year. There was a time when brightness was a huge factor and only neon lighting would come first. However, LED lighting is getting better and brighter each year and the majority of people will now say that LED is better than Neon. See for yourself, what do you think? 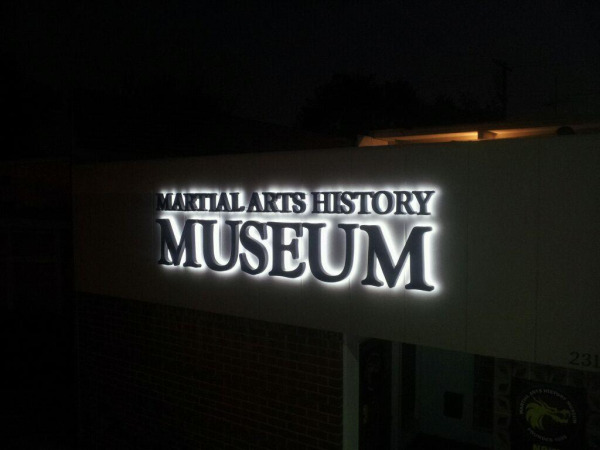 The Museum of Martial Arts wanted their new sign to shine as bright as possible. Well…..that is what The Sign Studio did. Here at The Sign Studio, we manufactured and installed exactly what they wanted. The back-lit channel letters also known as "Reverse Channel Letters" and "Halo Lit Letters" provide a distinctive and memorable approach to any signage program. These channel letters are often utilized by signage clients who value a prestigious image. Reverse channel letters are produced with aluminum faces and sides (the side of a channel letter is called the return.) These letters are mounted away from the wall so a halo forms behind the letters. A clear polycarbonate back prevents birds and other animals from nesting inside theletter. When you are buying a sign for your business you are about to make one of the decisions that will have the greatest impact on how people perceive your business, how easy it is to find you and what image people will have about you. What message do you want to get over? You may want to attract customers into your business, you may want to warn people, you may want to give information or directions, you may be trying to comply with legal obligations. 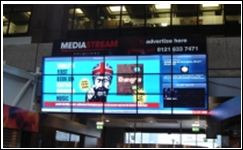 We have many ways to communicate your message - text, graphics, pictures, special effects. What style do your think will work best? Too many people underestimate the size of their sign. The sign is of no use if it cannot be easily seen: see the letter visibility page. 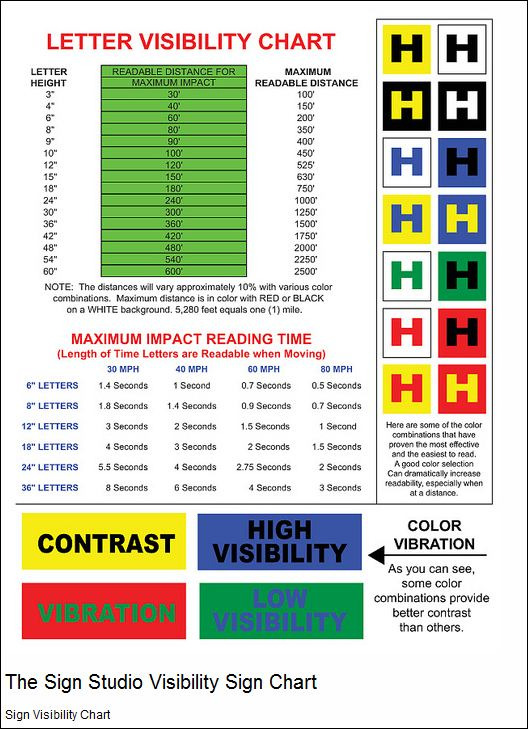 We can provide almost any color you can think of but it is vital to make the right selections for your message; we have created a color contrast chart to better illustrate the issues involved in choosing the right colors for your sign. Our computer technology allows us to offer you a wide variety of fonts, typestyles and other effects. How long do you need the sign to last - a few days before the Xmas Fair banner needs to come down - or for the 10 years of the new property lease you just signed? Last, but by no means least, you need a sign that you can afford, a sign that will give you the maximum value for your money. 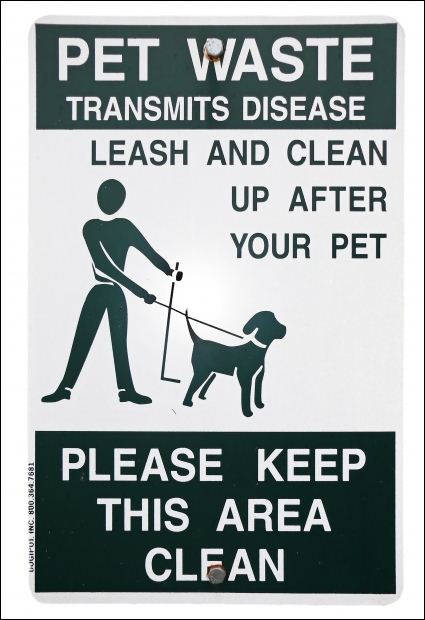 Clean up after your Pet Sign……How Important they really are…. The Association of Professional Animal Waste Specialists (aPaws) began this project in 2002 to address the public health issues caused by pet waste. Did you know dog droppings are one of the leading sources of E. coli bacterial pollution? One gram of dog feces contains over 20,000,000 E. coli cells. The cumulative effects of thousands of animals in a metropolitan area can contaminate soil and water if they are not properly cleaned up after. Residential and commercial yard signs can help remind pet owners to be responsible and pick up after their pets. Individual homeowners who have highly-trafficked front yards in an urban area may want to create and post a sign asking pet owners to “scoop the poop.” Apartment complex managers in buildings that allow pets should certainly post signage to remind tenants to respect the shared space. If a waste problem persists, it may help to provide a plastic bag dispenser underneath the sign. A professionally made sign in plastic or metal will hold up outdoors and look better than a hand-made cardboard sign. Let The Sign Studio representatives help you create a visual communications piece that keeps your yard and city cleaner. Whether your project involves signage, wayfinding, branding or a combination of these disciplines, it is important that the design and documentation be taken seriously. Our goal is to design and document a solution that will best fit our client's brief. Research and in-depth analysis will ensure success throughout this phase. The Sign Studio's design process always commences with a detailed briefing session to understand the needs of the client. Our designers then commence research and based on the findings, sketches and initial design concepts are prepared. From these initial designs, a final concept is worked towards by working closely with the client. Prototyping can then be produced that enable the client to visualize, touch and feel the finalized concepts. It confirms if the designs are practical and suitable for the built environment in which they will be placed. Once the prototypes have been approved, the documentation process can begin. 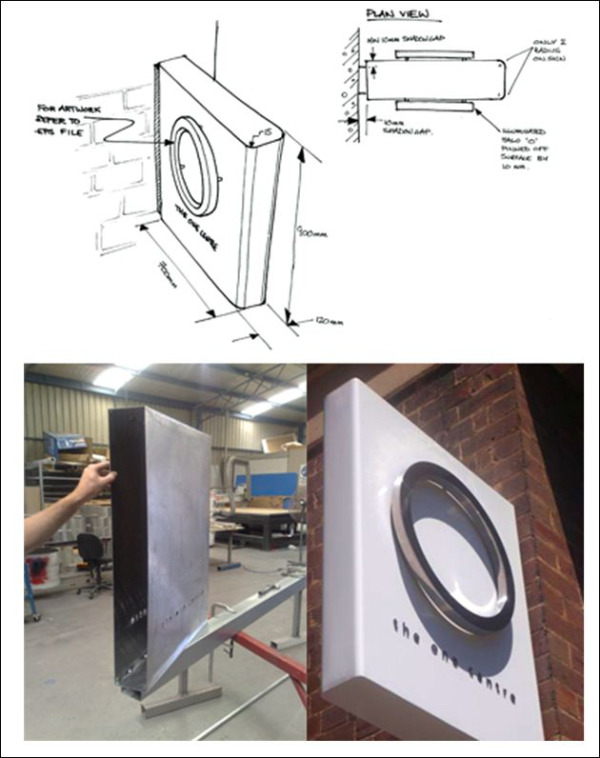 The final sign design concepts will be developed into detailed 2D and/or 3D drawings including specifications. Specifications usually include, but are not limited to: dimensions, materials, finishes, visuals, site plans or in mockups and shop drawings, and assembly detail, etc. We're a leading supplier of restroom signs, including ADA compliant Braille restroom signs in standard and designer colors. Here you'll find ADA acrylic bathroom signs with English Braille, as well as Spanish and Bilingual text and Braille options. In addition to Braille restroom signs, you can order non-Braille bathroom signs in most of the same colors. And if you need restroom signs with different wording, colors or symbols, simply contact us at (818) 843-9200 or info@signstudiola.com. We'll be happy to assist you with your bathroom sign needs. 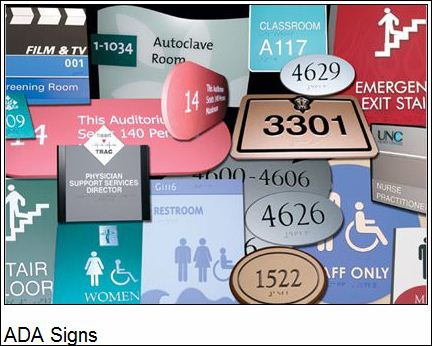 The Americans with Disabilities Act (ADA), the ADA Accessibility Guidelines and the American National Standards Institute (ANSI) have specifications governing the design of special needs signage. All of The Sign Studio's restroom signs are designed to meet these specifications, including accurate translations in Grade 2 Braille. Recognizing the needs of our multilingual customers, we produce Braille and non-Braille bathroom signs with accurate Spanish translation – both written and Braille. Our restroom sign clients include the military and other government agencies, industrial and manufacturing firms, retail establishments, schools, physician offices, health care facilities, religious institutions, professional buildings and many others. Business signs are a cost-effective advertising tool that create a basic link to your customers. Corporate signs allow consumers to know they have arrived, builds brand recognition, and creates an awareness of your product or service. Select a size of sign that will ensure maximum visibility without creating an eyesore. It is also important to research municipal government regulations or those guidelines set out by your landlord. Color, logo size, and font are all important aspects of the sign. The use of lights, symbols and letters create visual interest and attract the eye. The durability of your sign is also a consideration. Choose a material that will be able to withstand environmental extremes – sun, wind, rain and snow. The manner in which a sign is mounted can detract from overall effectiveness. Ensure that your sign is visible from as many angles as possible, keeping in mind that pedestrians and motorists have a lower line of sight. Experts at The Sign Studio can assist you in designing the perfect sign for your business! What catches the eye of a passerby and transforms them from window shopper to customer? The simple answer is signs, signage, banners and advertisements. We've all had those whiplash moments where we saw something out of the corner of our eye that grabbed our attention. There are bright signs shouting our name or flags gently waving "come hither" in the wind. We've become a nation of enticement and action, no longer excited by boring words stating what the big sale item is for the day, or how prices have been slashed and dashed. We want to be seduced. We want an eloquent statement that moves us. We've become an attention deficit society that needs to be smacked in the face by a brightly decorated windsock or have the familiar snap of a flag yelling in our ear in order to look up from our cell phones. While this may seem like a modern or recent harsh reality, the fact is, it is a thought process that has been engrained in our minds since childhood. Stores want attention, and people want stimulation. Signs, signage, banners and advertisements present a win-win situation for both, so let's give people what they want. All About Decals and Placement of Decals……. A well-placed, quality decal can greatly increase exposure for your brand. The opportunities for decal placement are everywhere, but some locations and sizes are better than others. 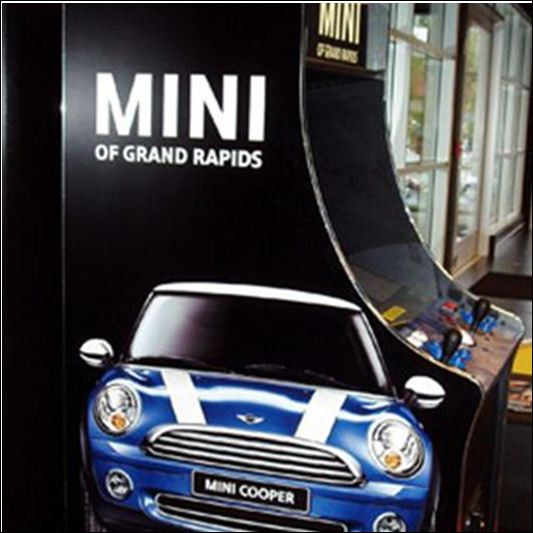 The most important factor in deciding on decal location and size is the surrounding environment. None of these graphics will be observed in a vacuum. Putting a beautifully designed decal in a place no one will notice it is much less effective than putting a dull decal in a highly noticeable area. For example, placing a floor decal in the store transition zone is very ineffective. The transition zone is the store entry and a few feet into the space. Customers are adjusting to the change in stimuli and are not paying attention to details around them. It is not advised to put anything you want customers to pay attention to in the transition zone, including shopping baskets, store layout information and especially advertisements. Decals are more effective when placed on high-traffic aisle floors, store windows or walls and company vehicles. The environment also dictates the content and size of the decal along with the placement. For example, a decal placed in a well-lit store aisle can have smaller text than a decal on a moving vehicle. 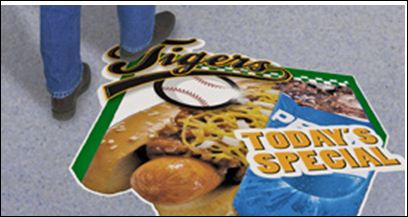 Floor decals act as high-impact billboards in an under-utilized marketing space and can drive foot traffic, promote sales and highlight special products. If a location has a blank wall, it is an excellent opportunity for a large decal. These large-scale designs are a great opening to grab attention with dramatic images. A company vehicle is both a necessity and an advertising opportunity. An attractive vehicle decal gives your business exposure while the delivery van or work truck makes the rounds around town. Consider the varying environments the vehicle will be observed in. Be sure the lettering is high-contrast and put contact information in a large font size so the information can be absorbed quickly and in low light.